Guide to working with SAML v1.x. ForgeRock® Access Management provides authentication, authorization, entitlement and federation software. This guide covers concepts, configuration, and usage procedures for working with Security Assertion Markup Language (SAML) v1.x features provided by ForgeRock Access Management. Access Management supports SAML version 1.0 and 1.1. This guide is written for anyone using Access Management for SAML v1.x identity and service providers. This chapter describes AM's support for the SAML v1.x framework for exchanging security data. SAML v1.x is an XML- and SOAP-based framework that allows online trusted partners to exchange security information. 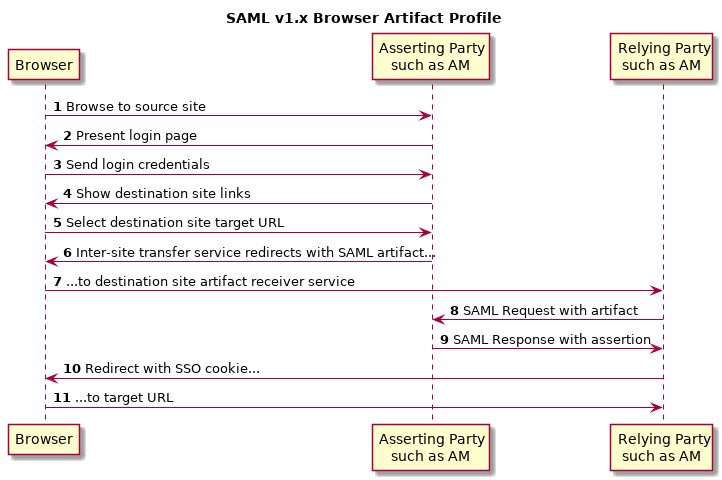 In particular, SAML v1.x defines mechanisms for browser based web single sign-on (SSO) across independent organizations that work together to permit SSO for access to resources. Although not strictly compatible with SAML v1.x, SAML v2.0 extends SAML v1.x to several additional use cases and also clarifies how partners share metadata with each other. Unless you are integrating with an existing SAML v1.x deployment consider using SAML v2.0, or an alternative, such as OAuth 2.0 or OpenID Connect 1.0, instead. See the following for more information: SAML v2.0 Guide, OAuth 2.0 Guide, and "Introducing OpenID Connect 1.0" in the OpenID Connect 1.0 Guide. AM's support for SAML 1.x requires stateful sessions. Be sure that AM is configured for stateful sessions—the default configuration—before attempting to use SAML 1.x functionality in AM. Web SSO solutions often use SSO session cookies. Browsers do not return cookies across domains. For instance, browsers do not return cookies set by servers in the example.com domain to servers in the example.net domain. SAML v1.x works around this limitation of HTTP cookies. Before SAML v1.x was defined, there were already proprietary SSO solutions, but the solutions did not interoperate well across domains. SAML v1.x specifies a standard, cross-domain, interoperable SSO mechanism that works together with proprietary SSO services in a particular domain. Before SAML v1.x was defined, there was not an easy way to communicate security attributes across organization boundaries. SAML v1.x simplifies the communication of security attributes between different organizations. In SAML v1.x, business partners can play two roles. The asserting party, also known as the SAML authority and whose domain is the Source site, authenticates users and asserts information about them. The relying party, whose domain is known as the Destination site, consumes assertions and uses information from the assertion to decide whether to allows access to resources. In the Web Browser SSO Profiles for SAML v1.x, the user generally starts by authenticating with the asserting party and then selecting a relying party link to browse. Alternatively, the "Destination-Site-First" scenario can start with the user browsing to the relying party's site and being redirected to the asserting party's site to authenticate. The SAML v1.x Inter-site Transfer Service is a service that redirects the authenticated user from the asserting party's site to the appropriate service on the relying party's site. The Inter-site Transfer Service also handles artifact and redirect generation. How this service transfers the user to the relying party's site depends on how the asserting party and the relying party exchange messages. The asserting party and relying party can exchange messages either by reference, where the asserting party sends an artifact (a base64-encoded reference to the assertion) as a query string parameter value, or by value, where the asserting party directs the user's browser to HTTP POST the assertion to the relying party. When the asserting party and relying party use artifacts, the Inter-site Transfer Service redirects the user's browser to the relying party's Artifact Receiver Service with the artifact as the value of a query string parameter. The relying party retrieves the artifact from the query string, and then sends a SAML Request to the Responder Service at the asserting party. The asserting party replies with a SAML Response containing one or more assertions. See section 4.1.1 of the SAML v1.1 technical overview for more detail. When the assertion is sent using the Browser/POST Profile, the Inter-site Transfer Service responds to the user's browser with an auto-submitting form containing the SAML response. The browser then submits the SAML response as form data by HTTP POST to the relying party's Assertion Consumer Service. The relying party's Assertion Consumer Service then processes the assertion. See section 4.2.1 of the SAML v1.1 technical overview for more detail. The Assertion Consumer Service at the relying party validates the digital signature on the SAML response, and redirects the browser to the target URL of the resource that the user is attempting to access. The server providing that resource uses the relying party's authorization decision capabilities to establish whether the user can access the resource. If so, the resource is returned to the user's browser. If the relying party is using AM, for example, then the relying party sets an AM SSO token based on the SAML response, and this token is used to track the user's session for authorization. Organizations working together to achieve SAML v1.x web SSO are called trusted partners in this context. Trusted partners agree on which services they provide, which web SSO profiles they implement, and how information is exchanged in the assertions, including profile attribute values. Once the trusted partners have reached agreement on how they interact, you can collect information about your partners' configurations and configure AM to match your organization's part of the agreement. • "Preparing To Secure SAML v1.x Communications"
• "Configuring SAML v1.x For Your Site"
• "Configuring SAML v1.x Trusted Partners"
• "Testing SAML v1.x Web SSO"
Before you can configure AM to allow web SSO with trusted partners, you must first gather information about the agreement itself, as well as information for your site and for your partners sites. For more information about your own public key certificates, see "Preparing To Secure SAML v1.x Communications". For your own Site ID, see the following procedure. Trusted partners should ask you for a Site ID. AM generates a SAML v1.x Site ID value at configuration time. This Site ID value corresponds to the server. To find this in the AM console, see Federation > SAML 1.x Configuration > Local Site Properties > Site Identifiers, and then click your server URL. If you have multiple servers in an AM site set up behind a load balancer, you can generate a Site ID, and then use it for all the servers in your site. Generate a Site ID for your site, using the primary site URL. SAML communications are secured using Public Key Infrastructure (PKI). Communications should be protected over the network by HTTPS, and relying parties requesting assertions should use SSL or TLS mutual authentication to identify each other, meaning they should be able to trust each others' certificates. Furthermore, when an asserting party works through the user's browser to post an assertion to the relying party, then the asserting party must digitally sign the SAML response. A certificate can be trusted when the signer's certificate is trusted, or when the certificate itself is trusted. Trusted partners must either use public key certificates signed by a well-known Certificate Authority (CA), or share their self-signed or private CA signing certificates. See "Setting Up Keys and Keystores" in the Setup and Maintenance Guide for instructions on handling your own key pairs. For specific instructions on changing signing keys, see "To Change Default test Signing Key" in the Setup and Maintenance Guide. If necessary, share signing certificates with trusted partners. Import public key certificates shared by trusted partners into your AM keystore. After you have gathered configuration information and prepared to secure SAML v1.x communications you can configure SAML v1.x for your site. When you enter SAML v1.x configuration data, The AM console escapes these special characters by default: & < > " ' /. If you have already escaped these characters in the data that you plan to enter in the AM console, set the value of the com.sun.identity.saml.escapeattributevalue property to false under Configure > Server Defaults > Advanced, and then restart AM or the container in which it runs to prevent The AM console from escaping the characters for you. "To Configure Asserting Party Local Site Properties"
"To Configure Relying Party Local Site Properties"
Log in to the AM console as administrator, amadmin, navigate to Realms > Realm Name > Applications > SAML > SAML 1.x Configuration, and then click Local Site Properties. If the target specifier query string parameter is something other than the standard default TARGET, set it in the Target Specifier field. If instead of the default server Site Identifier, you use a Site Identifier for the AM Site, click New in the Site Identifiers table, and then add the information for the AM Site, including the Site ID that you generated. Target URLs let you configure URLs for which HTTP POST is always used. When the TARGET specified matches a URL in the Target URLs list, then the asserting party sends the response to the relying party by HTTP POST of an auto-submitting form returned to the browser. If necessary, set the Default Protocol Version. In the Assertion section, change the values if necessary. Remove Assertion: Yes means that assertions are deleted from memory after they are used, rather than deleted only when they expire. In the Artifact section, change the values if necessary. In the Signing section, for an asserting party using the HTTP POST profile, check at least Sign SAML Assertion. By default AM signs messages using the certificate with alias test. Check other options as required by your trusted partners. In the Attribute Query section, if relying parties issue attribute queries, then set the default list of profile attributes to return. In the NameID Format section, map SAML NameID formats to local AM user profile attributes. This allows AM to map a remote user to a local user profile. In the Attribute Map section, if the parties exchange attributes, then map the SAML attributes requested by relying parties to local AM user profile attributes. Using the configuration information you have gathered complete the following steps. Ignore the Target URLs table for a relying party. Ignore the Signing section for relying parties, unless trusted partners require that your site signs SAML requests. Ignore the Attribute Query section for relying parties. This allows AM to map a remote user to a local user profile when not all the partners are using AM user IDs. "To Configure a Trusted Relying Party"
"To Configure a Trusted Asserting Party"
Log in to the AM console as administrator, amadmin, navigate to Realms > Realm Name > Applications > SAML > SAML 1.x Configuration, and then click New in the Trusted Partners table. Under Destination, select the SAML profiles used with the relying party. In the Common Settings section, set at least a name for the partner configuration, enter the partner's Site ID as the Source ID, and specify the fully qualified domain, optionally with the port number, of the relying party in the Target field. The value in the target field is matched to TARGET parameter values, so it should correspond to the real domain (and optionally port number) in the URLs of resources to access at the relying party's site. Optionally set a custom site attribute mapper, a custom name identifier mapper, and the SAML Version to use with the partner. You must also set one or more values in the host list for the partner to identify all hosts from the partner site that can send requests. AM rejects SAML requests from hosts not specified in this list. In the Destination section, if the SAML Artifact profile is used with the relying party, set the SAML URL to the relying party's endpoint that receives the artifact and contacts your asserting party. If the SAML POST profile is used with the relying party, set the Post URL to the relying party's endpoint that consumes the assertion in the HTTP POST form data and redirects the user's browser to the target at the relying party's site. If the relying party makes SAML SOAP query requests, optionally set custom attribute or action mappers. If the relying party signs requests, then either requests include the certificate for the signing key in the KeyInfo element, or AM must find the signing certificate elsewhere. If the relying party provides the signing certificate separately, import the signing certificate into AM's default keystore file, and set the alias for the signing certificate here in the configuration. For more information about AM's default keystore, see "Setting Up Keys and Keystores" in the Setup and Maintenance Guide. Set the issuer to a host:port combination corresponding to the relying party server issuing the requests. Under Source, select the SAML profiles used with the asserting party. In the Common Settings section, set at least a name for the partner configuration and enter the partner's Site ID as the Source ID. Optionally set a custom account mapper. By default AM maps accounts based on the NameID format configuration for your site. If the asserting party signs assertions (or other messages) and you have imported the signing certificate into AM's keystore (also used as a trust store), then enter the signing certificate alias. If instead the asserting party includes the signing certificate in the KeyInfo element of signed messages, then you can leave the alias blank. 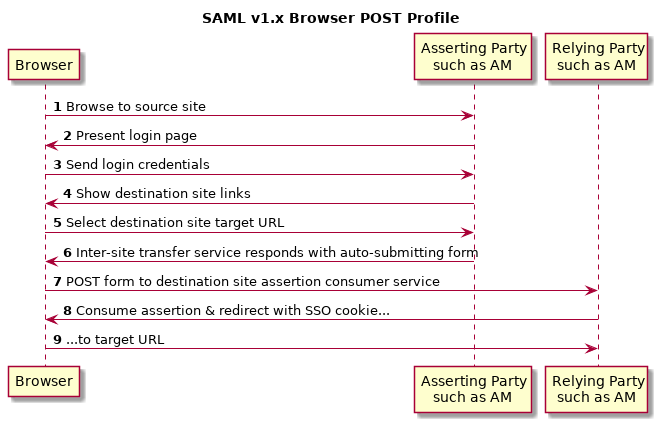 In the Source section, if the SAML Artifact profile is used with the asserting party, set the SOAP URL to the asserting party endpoint that responds to requests such as https://ap.example.net/openam/SAMLSOAPReceiver. If the asserting party requires authentication to the SOAP URL, then configure the settings appropriately. If the SOAP URL is accessed over HTTP, choose None or Basic. If the SOAP URL is accessed over HTTPS, choose SSL/TLS or SSL/TLS with Basic. Basic means HTTP Basic authentication (with username and password). For HTTP Basic authentication, the authentication at this level is performed by the application server container, not AM. Therefore if the asserting party runs AM and wants to enforce HTTP Basic authentication, the asserting party administrator must set up the container to handle HTTP Basic authentication for the SOAP URL. Set the SAML Version as necessary. If the SAML POST profile is used with the asserting party, set the Issuer to the issuer name, such as a host:port combination. • "To Prepare the Servers"
• "To Prepare to Test the Asserting Party"
• "To Prepare to Test the Relying Party"
• "To Try SAML v1.x Web SSO"
Install two separate servers, one to act as asserting party, the other to act as relying party. How you do this in practice is up to you. You can, for example, set up two separate AM servers on a single host by adding aliases for the hosts in your hosts file, and by using separate containers that listen on different ports. For example, if your host is a laptop, you can add the aliases to the loopback address as in the following example line from an /etc/hosts file. Then, run one application server to listen on port 8080, and another to listen on port 9080. Deploy and configure AM server with the default configuration at http://ap.example.net:8080/ap for the asserting party and at http://rp.example.com:9080/rp for the relying party. This allows you to use the default configuration for both servers. See the Installation Guide for instructions. The procedures in this section use those example URLs to represent the AM servers acting as asserting and relying parties. On the asserting party server, login to the AM console as administrator, navigate to Realms > Realm Name > Applications > SAML > SAML 1.x Configuration, and then click Local Site Properties. Click the server's instance ID in the Site Identifiers table. Record the asserting party Site ID for later use. On the relying party server, login to the AM console as administrator, navigate to Realms > Realm Name > Applications > SAML > SAML 1.x Configuration, and then click Local Site Properties. Log in to the AM console as administrator, navigate to Realms > Realm Name > Applications > SAML > SAML 1.x Configuration, and then click Local Site Properties. On the Local Site Properties page for the asserting party server, select Sign SAML Response. The asserting party thus signs SAML responses with the private key for the default test certificate. Save your work, and then click Back to Federation. Click New in the Trusted Partners table to add the relying party as a trusted partner. In the Destination area of the Select trusted partner type and profile page, select Artifact and Post (not SOAP Query), and then click Next. Apply the following settings, adjusted for the host names you use. If a field is not mentioned, accept the defaults. Click Finish to save your work. Log in to the AM console as administrator, navigate to Realms > Realm Name > Applications > SAML > SAML 1.x Configuration, and then click New in the Trusted Partners table to add the asserting party as a trusted partner. In the Source area of the Select trusted partner type and profile page, select Artifact and Post, and then click Next. Log out of The AM console on both servers. Try Web SSO using the SAML Artifact profile. Simulate the AM administrator browsing the asserting party's site, and selecting a link to the AM console on the relying party's site. The URL to simulate this action is something like http://ap.example.net:8080/ap/SAMLAwareServlet?TARGET=http://rp.example.com:9080/rp. AM requires that you authenticate. Login as AM demo user, demo with default password changeit, on the asserting party server. Notice that you are redirected to the AM console on the relying party server, and that you are successfully logged in as the demo user. The URL to simulate this action is something like http://ap.example.net:8080/ap/SAMLPOSTProfileServlet?TARGET=http://rp.example.com:9080/rp. Login as AM administrator, amadmin, on the asserting party server. Notice that you are redirected to the AM console on the relying party server, and that you are successfully logged in as amadmin. This reference section covers common configuration settings for federation, some of which apply to AM's SAML v1.x support. The maximum content length allowed in federation communications, in bytes. Whether to verify that the partner's signing certificate included in the Federation XML document is the same as the one stored in the said partner's meta data. OpenAM redirects users here when an error occurs in the SAML2 engine. Both relative and absolute URLs are supported. Users are redirected to an absolute URL using the configured HTTP Binding whereas relative URLs are displayed within the request. The possible values are HTTP-Redirect or HTTP-POST. The Federation system uses this class to get/set user profile attributes. The default implementation uses the Identity repository APIs to access user profile attributes. A custom implementation must implement the com.sun.identity.plugin.datastore.DataStoreProvider interface. The Federation system uses this class to fetch service configuration. The default implementation uses the SMS APIs to access service configuration. A custom implementation must implement the com.sun.identity.plugin.configuration.ConfigurationInstance interface. The Federation system uses this class to record log entries. The default implementation uses the Logging APIs to record log entries. A custom implementation must implement the com.sun.identity.plugin.log.Logger interface. The Federation system uses this class to interface with the session service. The default implementation uses the standard authentication and SSO APIs to access the session service. A custom implementation must implement the com.sun.identity.plugin.session.SessionProvider interface. The Federation system uses this class to decode password encoded by OpenAM. The default implementation uses the internal OpenAM decryption API to decode passwords. A custom implementation must implement the com.sun.identity.saml.xmlsig.PasswordDecoder interface. The Federation system uses this class to digitally sign SAML documents. The default implementation uses the XERCES APIs to sign the documents. A custom implementation must implement the com.sun.identity.saml.xmlsig.SignatureProvider interface. The Federation system uses this class to provide access to the underlying Java keystore. The default implementation uses the Java Cryptographic Engine to provide access to the Java keystore. A custom implementation must implement the com.sun.identity.saml.xmlsig.KeyProvider interface. The algorithm used to canonicalize XML documents. The algorithm used to sign XML documents. The default digest algorithm to use in signing XML. The default signature algorithm to use in case of RSA keys. The default signature algorithm to use in case of DSA keys. The default signature algorithm to use in case of EC keys. The algorithm used to transform XML documents. The Federation system uses this class to gain access to the monitoring system. The default implementation uses the built-in OpenAM monitoring system. A custom implementation must implement the com.sun.identity.plugin.monitoring.FedMonAgent interface. The default implementation uses the built-in OpenAM monitoring system. A custom implementation must implement the com.sun.identity.plugin.monitoring.FedMonSAML1Svc interface. The SAML2 engine uses this class to gain access to the monitoring system. The default implementation uses the built-in OpenAM monitoring system. A custom implementation must implement the com.sun.identity.plugin.monitoring.FedMonSAML2Svc interface. The ID-FF engine uses this class to gain access to the monitoring system. The default implementation uses the built-in OpenAM monitoring system. A custom implementation must implement the com.sun.identity.plugin.monitoring.FedMonIDFFSvc interface. Control to grant or to deny access to a resource. The act of making an account temporarily or permanently inactive after successive authentication failures. Defined as part of policies, these verbs indicate what authorized subjects can do to resources. In the context of a policy decision denying access, a hint to the policy enforcement point about remedial action to take that could result in a decision allowing access. User having privileges only to read and write policy agent profile configuration information, typically created to delegate policy agent profile creation to the user installing a policy agent. Entity with read-only access to multiple agent profiles defined in the same realm; allows an agent to read web service profiles. In general terms, a service exposing protected resources. In the context of AM policies, the application is a template that constrains the policies that govern access to protected resources. An application can have zero or more policies. Application types act as templates for creating policy applications. Application types define a preset list of actions and functional logic, such as policy lookup and resource comparator logic. Application types also define the internal normalization, indexing logic, and comparator logic for applications. Access control that is based on attributes of a user, such as how old a user is or whether the user is a paying customer. The act of confirming the identity of a principal. A series of authentication modules configured together which a principal must negotiate as configured in order to authenticate successfully. Positive integer associated with an authentication module, usually used to require success with more stringent authentication measures when requesting resources requiring special protection. AM authentication unit that handles one way of obtaining and verifying credentials. The act of determining whether to grant or to deny a principal access to a resource. In OAuth 2.0, issues access tokens to the client after authenticating a resource owner and confirming that the owner authorizes the client to access the protected resource. AM can play this role in the OAuth 2.0 authorization framework. Arrangement to federate a principal's identity automatically based on a common attribute value shared across the principal's profiles at different providers. Batch job permanently federating user profiles between a service provider and an identity provider based on a list of matched user identifiers that exist on both providers. Group of providers, including at least one identity provider, who have agreed to trust each other to participate in a SAML v2.0 provider federation. In OAuth 2.0, requests protected web resources on behalf of the resource owner given the owner's authorization. AM can play this role in the OAuth 2.0 authorization framework. Defined as part of policies, these determine the circumstances under which which a policy applies. Environmental conditions reflect circumstances like the client IP address, time of day, how the subject authenticated, or the authentication level achieved. Subject conditions reflect characteristics of the subject like whether the subject authenticated, the identity of the subject, or claims in the subject's JWT. LDAP directory service holding AM configuration data. AM capability allowing single sign-on across different DNS domains. Granting users administrative privileges with AM. Decision that defines which resource names can and cannot be accessed for a given subject in the context of a particular application, which actions are allowed and which are denied, and any related advice and attributes. Federation configuration information specific to AM. Standard, XML-based access control policy language, including a processing model for making authorization decisions based on policies. Standardized means for aggregating identities, sharing authentication and authorization data information between trusted providers, and allowing principals to access services across different providers without authenticating repeatedly. Service provider application capable of participating in a circle of trust and allowing federation without installing all of AM on the service provider side; AM lets you create Java Fedlets. Refers to configuration properties for which changes can take effect without restarting the container where AM runs. Set of data that uniquely describes a person or a thing such as a device or an application. Linking of a principal's identity across multiple providers. Entity that produces assertions about a principal (such as how and when a principal authenticated, or that the principal's profile has a specified attribute value). Data store holding user profiles and group information; different identity repositories can be defined for different realms. Java web application installed in a web container that acts as a policy agent, filtering requests to other applications in the container with policies based on application resource URLs. Federation configuration information for a provider. Set of rules that define who is granted access to a protected resource when, how, and under what conditions. Agent that intercepts requests for resources, directs principals to AM for authentication, and enforces policy decisions from AM. Entity that manages and stores policy definitions. Entity that evaluates access rights and then issues authorization decisions. Entity that intercepts a request for a resource and then enforces policy decisions from a PDP. Entity that provides extra information, such as user profile attributes that a PDP needs in order to make a decision. Represents an entity that has been authenticated (such as a user, a device, or an application), and thus is distinguished from other entities. When a Subject successfully authenticates, AM associates the Subject with the Principal. In the context of delegated administration, a set of administrative tasks that can be performed by specified subjects in a given realm. Agreement among providers to participate in a circle of trust. AM unit for organizing configuration and identity information. Realms can be used for example when different parts of an organization have different applications and user data stores, and when different organizations use the same AM deployment. Administrators can delegate realm administration. The administrator assigns administrative privileges to users, allowing them to perform administrative tasks within the realm. Something a user can access over the network such as a web page. Defined as part of policies, these can include wildcards in order to match multiple actual resources. In OAuth 2.0, entity who can authorize access to protected web resources, such as an end user. In OAuth 2.0, server hosting protected web resources, capable of handling access tokens to respond to requests for such resources. Defined as part of policies, these allow AM to return additional information in the form of "attributes" with the response to a policy decision. Access control that is based on whether a user has been granted a set of permissions (a role). Standard, XML-based language for exchanging authentication and authorization data between identity providers and service providers. Entity that consumes assertions about a principal (and provides a service that the principal is trying to access). The interval that starts with the user authenticating through AM and ends when the user logs out, or when their session is terminated. For browser-based clients, AM manages user sessions across one or more applications by setting a session cookie. See also Stateful session and Stateless session. Capability that lets any AM server in a clustered deployment access shared, persistent information about users' sessions from the CTS token store. The user does not need to log in again unless the entire deployment goes down. Unique identifier issued by AM after successful authentication. For a Stateful session, the session token is used to track a principal's session. Capability allowing a principal to end a session once, thereby ending her session across multiple applications. Capability allowing a principal to authenticate once and gain access to multiple applications without authenticating again. Group of AM servers configured the same way, accessed through a load balancer layer. The load balancer handles failover to provide service-level availability. Use sticky load balancing based on amlbcookie values to improve site performance. The load balancer can also be used to protect AM services. Standard federation configuration information that you can share with other access management software. An AM session that resides in the Core Token Service's token store. Stateful sessions might also be cached in memory on one or more AM servers. AM tracks stateful sessions in order to handle events like logout and timeout, to permit session constraints, and to notify applications involved in SSO when a session ends. An AM session for which state information is encoded in AM and stored on the client. The information from the session is not retained in the CTS token store. For browser-based clients, AM sets a cookie in the browser that contains the session information. When a subject successfully authenticates, AM associates the subject with the Principal that distinguishes it from other subjects. A subject can be associated with multiple principals. Data storage service holding principals' profiles; underlying storage can be an LDAP directory service or a custom IdRepo implementation. Native library installed in a web server that acts as a policy agent with policies based on web page URLs.